I knew even before looking at the answer choices that the question was about Bertolt Brecht’s Mother Courage and her Children. And since I had just taken a flipping 3 hour practice test, I thought it suitable that while I was correcting said test, I watch parts of one of my favorite documentaries, Theater of War. 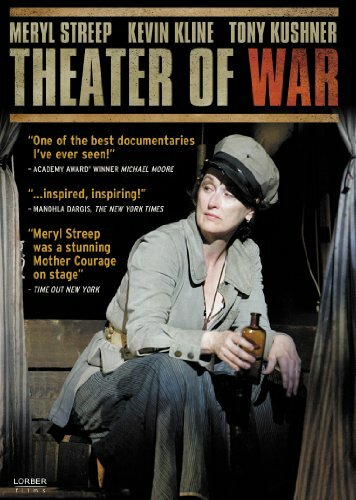 The film captures the development of the 2006 production of Mother Courage, staged in the Public Theater in New York City’s Central Park. The production was based on a new translation by Tony Kushner, and starred Meryl Streep and Kevin Kline along with other talented actors. The documentary, directed by John Walter (director of How to Draw a Bunny) offered fascinating behind-the-scenes looks at directorial choices, prop construction, costuming, and musical development. I first encountered Brecht in a modern drama course. We learned about the principles behind Epic Theater: dramatists like Brecht emphasized that we shouldn’t try to sympathize with tragic characters onstage. Gone were the days of pathos: Brecht continuously went out of his way to alienate an audience from his characters so that the audience could focus on the greater social issues portrayed in a play. The principle was termed Verfremdungseffekt, roughly translated as the “distancing effect.” Brecht wouldn’t allow an audience to passively take in the horrors of war, famine, plague, and human evil, and then go off to have expensive suppers in ritzy upper-class restaurants. Rather, he used signs onstage that stated scene spoilers, had the actors break through the fourth wall and talk to the audience directly, or had certain staging mechanics exposed to the audience. He included musical numbers. He wanted people to realize it wasn’t characters that had to change: it was society that needed to change, lest we all perish in a world dominated by greed, fear, hatred, and death. The Walter film sketched some of the theoretical underpinnings of Brecht’s play, and the historical relevance of Marxism in Brecht’s writings was underlined by individuals like novelist Jay Cantor, who is interviewed and shown teaching an undergraduate class on Marxism and Brecht. During more than one moment in the film, Cantor’s voice can be heard reading Marx’s ominous words as scenes from this 21st century staging of Brecht’s play are acted out before our eyes. “All that is solid melts into air, all that is holy is profaned, and man is at last compelled to face with sober senses, his real conditions of life, and his relation with his kind” (Marx, pg. 476). I first encountered Marx when I was 15, and reading Sophie’s World, the novel by Jostein Gaarder. Gaarder provided me with my first real glimpse at the history of philosophy; his book is a great work of both fiction and history, and I highly recommend it. I must say, though, while Gaarder provided me with a vague outline of what “communism” was (a term neither my brother nor my mother seemed to be able to define for me satisfactorily), I didn’t walk away understanding much about Marx. Flash forward to second year of college: there I was, gripping my copy of the Marx-Engels Reader, diligently underlining particular passages with a nice orange highlighter, and scratching my head at my inability to understand Marxist philosophy. Contemporary democratic society claimed Communism had failed. My father told me that while certain countries like China claimed to be Communist, their economies were more often than not based on capitalistic practices. I read Red Azalea, a brutal memoir by Anchee Min about the Cultural Revolution and its ravages on Chinese society. I read about Lenin and the Russian Revolution. My history teacher told me Trotsky was a liar. My mother told me of Venezuela in the 70s, when she proudly wore a Che Guevara t-shirt and listened to Silvio Rodriguez‘s revolutionary songs. She told me that only a fool could do so now with any sense of that same naive hope. I absorbed all the information I could, but still didn’t feel I quite understood. Even now, though I do feel I grasp the underpinnings of Marxist theory, I feel like there will always be this willful gap in my knowledge. But as I saw (and continue to see) how socialist propaganda, claims, and sentiments flamed by the same indignant and marvelously malleable fires that once flamed the Marxists are used daily back home to keep poor people ignorant and supportive of a despotic regime, I sense something has gone horribly awry. Brecht was right: society needed to change. But I highly doubt Marxism was the answer. Still, it’s refreshing to watch theater that has prime political importance today; the documentary includes footage of Iraq war protestors back in 2006. War is still war: it still creates profits and destroys, and mothers are left holding their dead children and wondering “Why?” It’s a great watch, and was definitely a nice break from The Canterbury Tales and the writings of Pepys and Dryden. This entry was posted in Current Events, Literature, Theatre, TV and Film and tagged Brecht, Meryl Streep, Mother Courage, Public Theater, Theater of War. Bookmark the permalink.